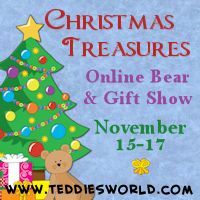 I have been accepted for the Teddies Worldwide Christmas Treasures Show. This time, instead of being in a dash to finish, I decided I would get all my bears done early :) I have been madly sewing and now I have 10 sewn bears/animals all ready to stuff. I hate the fact I have nothing to show you but hopefully it will be a lovely surprise on the 15th of November. Now they are sewn, I hope I will have things to show again soon ! As well as the online show, I am attending 2 "in the fur" shows. The first is The Brisbane Teddy Bear Fair this weekend (Sunday 18th Aug) in the Auditorium at Botanical Gardens, Mt Cootha Rd Toowong. This one is on Saturday 24th of August.